How do I transfer from one NDFCU account to another? You can transfer funds within NDFCU using online banking. 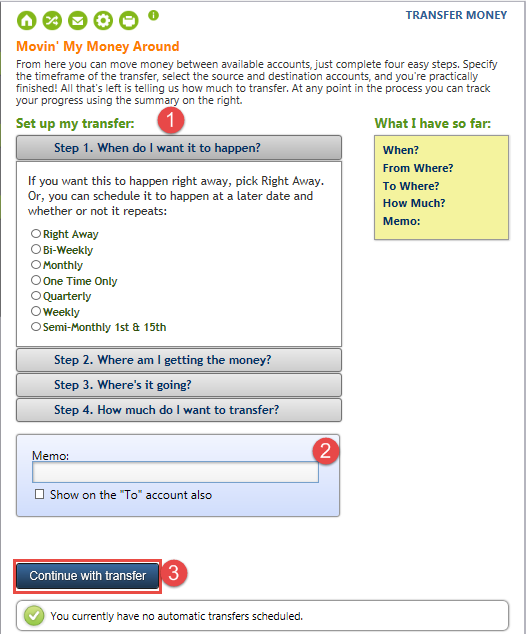 Login to online banking and select My Accounts then Transfer Money located under the Manage heading. If you have multiple accounts, you can transfer funds to any of them listed on your profile. You can transfer funds to make payments for your loans or credit cards and you can transfer money to other special accounts. Fill out the form by answering when you want the transfer to occur, where you are transferring from, where it is transferring to, the amount and enter your memo. To complete the transfer (whether it is recurring or a one time deal is determined on how you answered question 1), select Continue with Transfer.